I just love meat-balls. 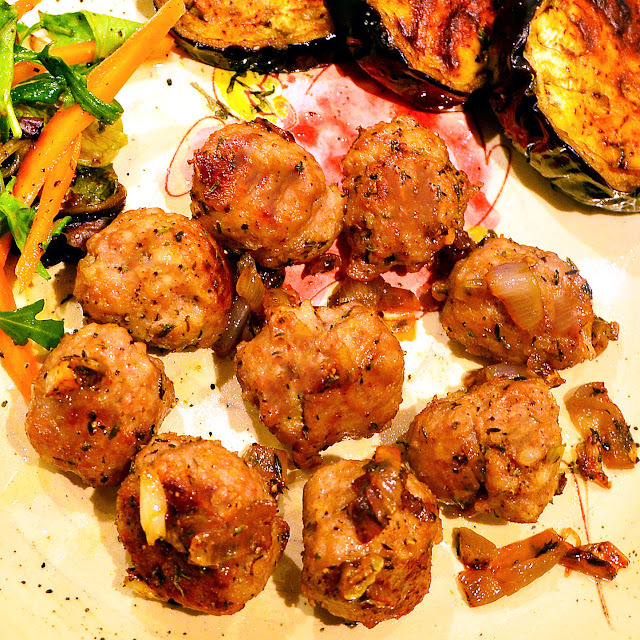 You probably can understand that when you see my multiple recipes based on meatballs [see here 1,2]. They are quick to prepare, require less oil as they are not deep fried, and are versatile and they can be enjoyed simply as a snack food or can be added to any sauce or stew. They always enhance the flavor of the sauce or stew in which they have been added. However rolling those up from minced meat do require some work. So here is my cheat on the rolling part. Simply cut up a sausage into bite size pieces, and you have your alternative for meat balls. 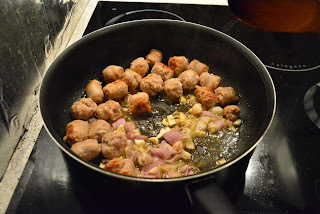 So this recipe is with sausages and I chose a simple French sausage called the Saucisse de Toulouse. 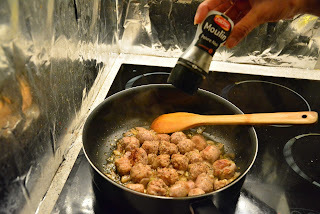 It is a pork sausage originating from the city of Toulouse in southern France. 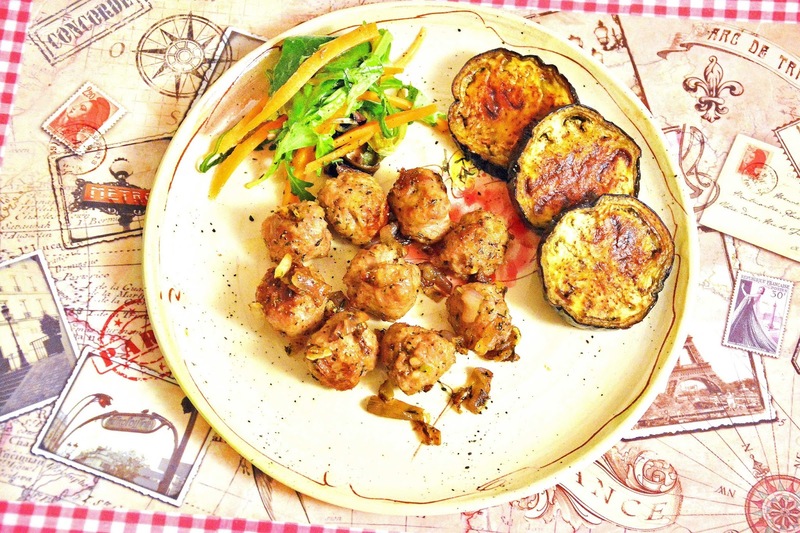 I chose this sausage because it does not have a strong characteristic taste or flavor, and thus almost like meat balls will not suppress the flavor of the other ingredients. You can however use any other sausage which has a low characteristic flavor. 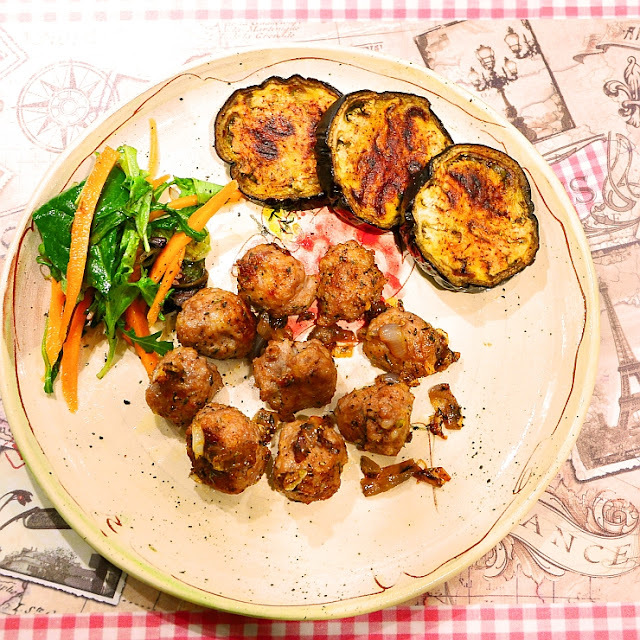 The dish is rather simple but quite filling for a quick, hassle free dinner. Here is the recipe. I served it with roasted eggplant (you can check the recipe here) and salad to assure a balanced diet. 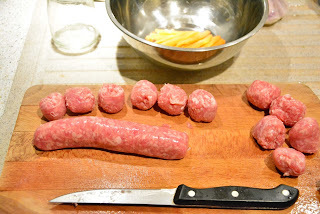 Cut the sausages into bite size pieces like shown below. 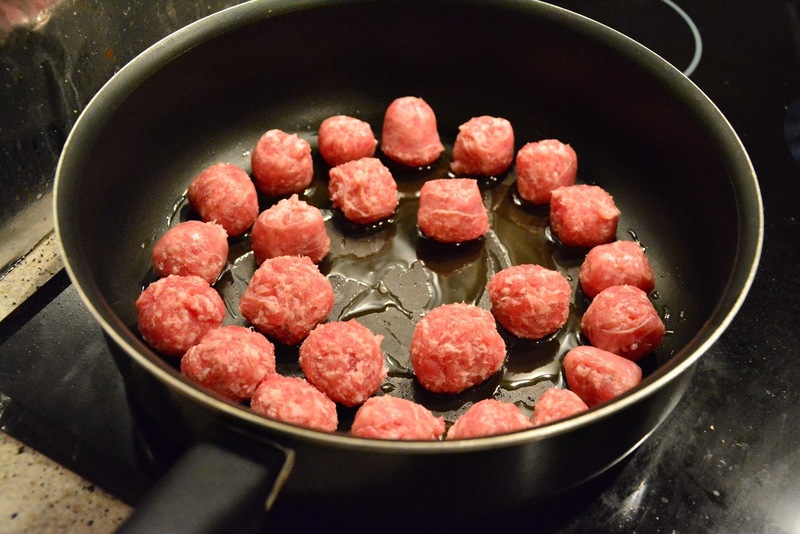 Pour olive oil in a nonstick pan. Place the chopped sausages. Cover and cook both sides in medium to high heat for around 5 minutes each side. The sausages will attain a golden brown color. Now add the chopped shallots and garlic. Sauté them. 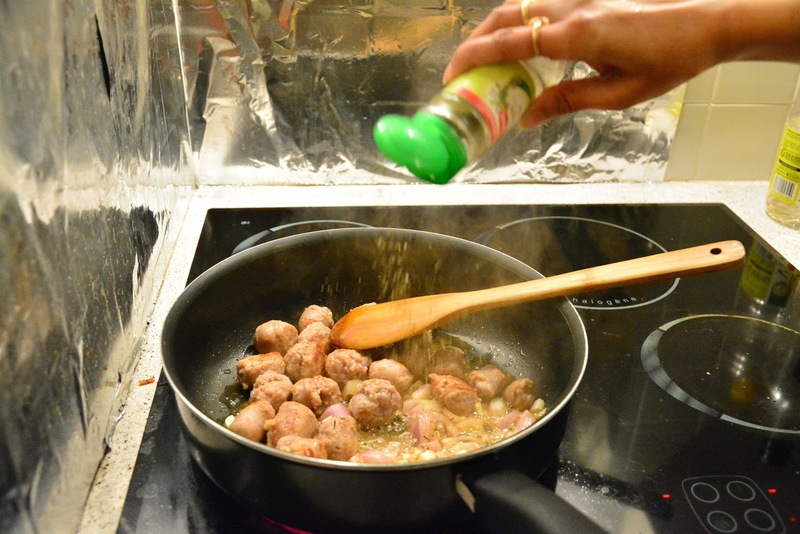 Season it with salt (add very little salt as the sausages generally contain salt) and black pepper. Sauté nicely and cover and cook for 5-7 minutes. 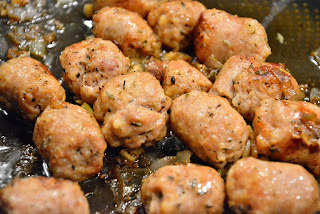 Sausage sauté is ready. Here is the final dinner after plating. A quick way to avoid rolling meat balls is to cut sausages into bite sized pieces. 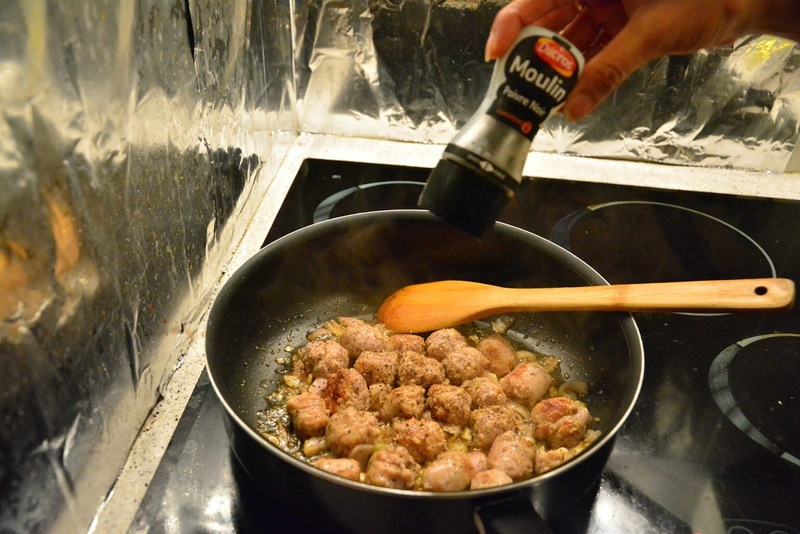 Here is a simple hassle free yet filling dinner made with Sausage of Toulouse. Pour olive oil in a nonstick pan. Place the chopped sausages. Cover and cook both sides in medium to high heat for around 5 minutes each side. Now add dried thyme. 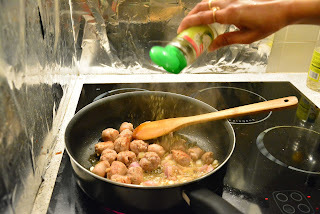 Season it with salt (add very little salt as the sausages generally contain salt) and black pepper.